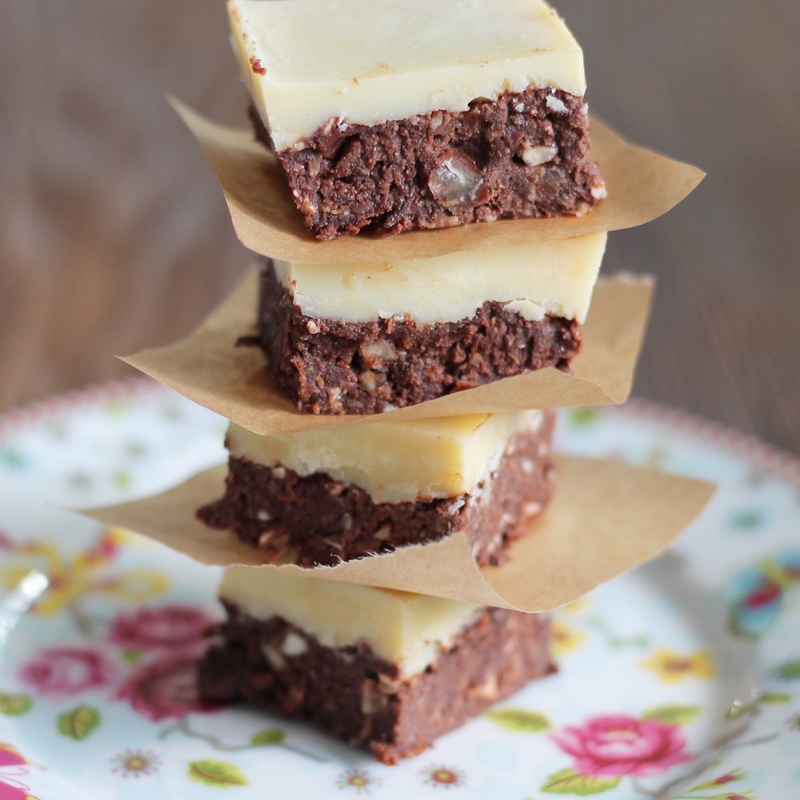 I needed something indulgent for my birthday this week and what is more indulgent than a chocolate brownie with a white chocolate topping? I had never actually used raw cacao butter as a topping and I didn’t know how it would solidify on top of a brownie but I gave it a go and was so happy with the result. These brownies are just delicious. Soft on the bottom with the crunch of the nuts and crunchy white chocolate on the top. The cacao offers heaps of bioavailable protein and the nuts and flaxseeds offer omega-3 essential fatty acids. These are gluten free, wheat free, grain free, dairy free, refined-sugar free, egg free and are vegan. Line a square cake tin with a piece of baking paper at the bottom. Drain the almonds, pat them dry with a piece of kitchen roll then put them in the food processor and blitz until mainly a meal but still with some chunks as this is nice for the brownie. Then add the rest of the brownie ingredients except for the chocolate chips and blend well. Turn out into a bowl and add the chocolate chips and mix well with a large spoon. Press into prepared cake tin and put in the freezer while you make the topping. To make the topping just put the cacao butter in a pan over a very low heat and very gently melt. Once melted add the rest of the ingredients. Wait for the topping to totally cool before taking the base out the freezer and pouring this over the top. It will seem very transparent but it will harden. Put it in the fridge for an hour then cut into slices.